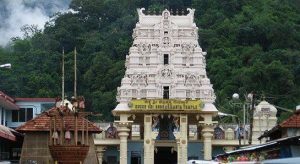 SHRI KSHETRA KUKKE SUBRAMANYA - Hosaligamma g, SHRI KSHETRA KUKKE SUBRAMANYA - Hosaligamma - Shiva Maha Purana, Vishnu Purana, garuda purana, bhavishya purana, skanda purana. To the south of subrahmany temple this is seen. This is a mother goddess. Hosaligamnaa and urusharaya are the two most important deities here. It is believed that this deity is bodygaurd of lord sri ubrahmanya. Kunkumarchane, mangalarathi, Hanukkah such offerings are done by the devotees. These are ancient temples. Bhoga (Nadavali) is offered to the dirty twice a year. Hosaligamma and purusharaya are none else than vatayakshini and candida.